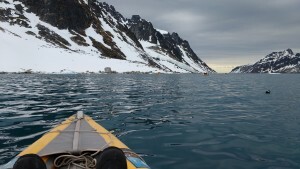 I spent the morning experiencing Fuglefjorden from the view of a kayak and zodiac. I’d never been kayaking before and was hoping someone would be willing to be my partner. While waiting near the mud room, I started talking with Ramesh and Sushma. They were hoping to take out two singles but when they heard of my plight they both agreed to let me tag along with Ramesh in a double. Such wonderful people! The kayaks are inflatable and way more stable then I imagined. Ramesh was a wonderful teacher and he put up with my random whacking of his paddle. 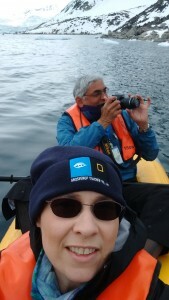 Despite Ramesh and Sushma’s advice to push with the raised hand rather than pull with the hand near the water to conserve energy I was still very sore by the time we had paddled around the fjord for an hour. It was beautiful and calm. 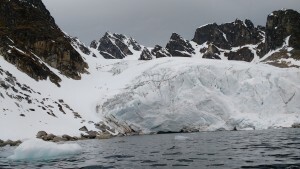 Surrounding the water were high peaks, snow, a glacier, and many pieces of varying sizes of ice; no icebergs but there were bergy bits, growlers, and brash ice. We passed several black guillemots just hanging out in the freezing water. Wait. What’s that you ask? Why, yes, I did learn to identify at least one bird on this expedition! It’s actually a pretty easy one. They have all black feathers except for a swath of white on either side. Their beak is black and their webbed feet built for paddling are a bright red. We came so close to some of them and they just floated along next to us like we weren’t even there. 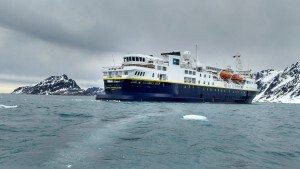 After returning to the National Geographic Explorer we immediately boarded a zodiac to get a closer look at the glacier. Eduardo was once again our guide. 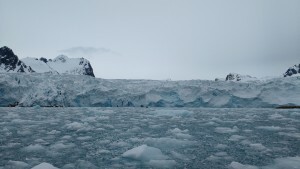 This glacier is a tidewater glacier because its snout reaches the sea and calves ice into the ocean. The fjord we were currently cruising in was once a valley created by a glacier in the last ice age and then flooded by rising sea levels to create the bay. Looking at the glacier today you may see strata comprised of soil and rocks. This occurred when the glacial ice mixed with glacial moraine; soil and rocks created by glacial erosion of the bedrock. Some moraines contain huge boulders called erratics. The layering look reminded me of sedimentary rock layers. The process of compacting snow into glacial ice is similar to sediments being compressed into solid rock. Both have tremendous pressure aiding the process, although I suppose the glacier doesn’t use heat as part of the process. Much of the afternoon was spent searching for wildlife. 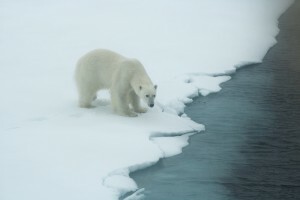 The captain steered us toward pack ice where we might see polar bears. The first bear of the afternoon was originally sighted on the ice, but by the time I got to the bridge it had decided to go for a swim. If you look closely his head is poking out of the water. Look in the lower left hand corner of the photograph. Rather than stress the bear the ship moved on. 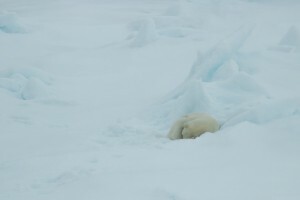 Later that night after dinner there was a lone bear resting on the ice. I decided to watch outside on the deck this time and was out there so long my camera lens fogged up. It was a wee bit misty out on the bow. Rich Reid, the National Geographic Photographer on board helped by wiping everyone’s lens off with his cloth and gave advice to keep the lens clear; keep the lid on until you are going to use it and point it down if the lid is off. Unfortunately, after hours in the weather my camera was not very happy. 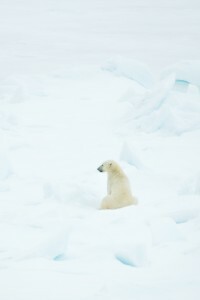 Fortunately, we were able to watch this amazing creature first from afar and then from up close. 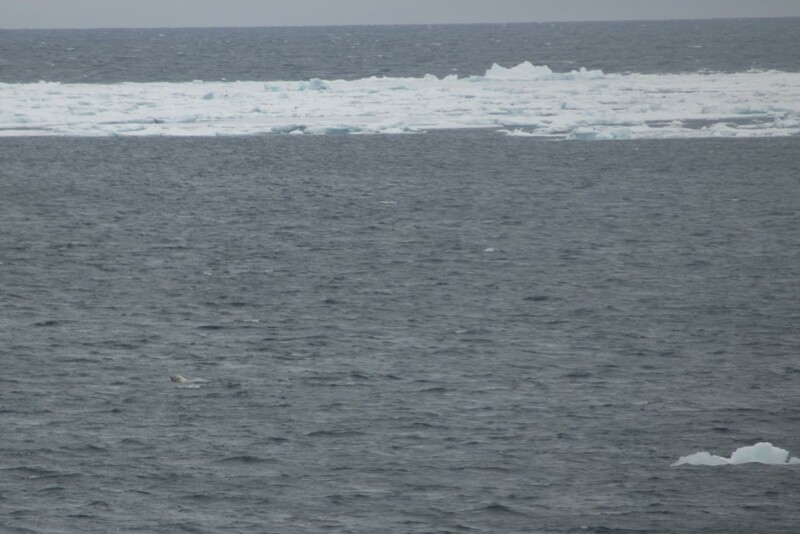 When we first approached the ice it was lying down, conserving energy, and pretty much ignoring the large vessel on the water. 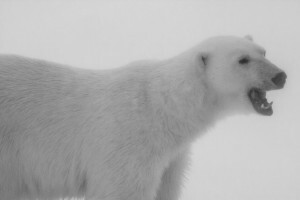 One of the behaviors Arctic animals use to keep warm is to use energy wisely. 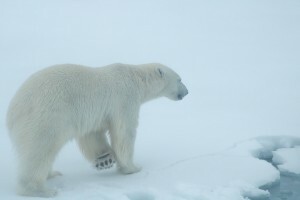 Especially in the summer, bears may go weeks or months without eating. 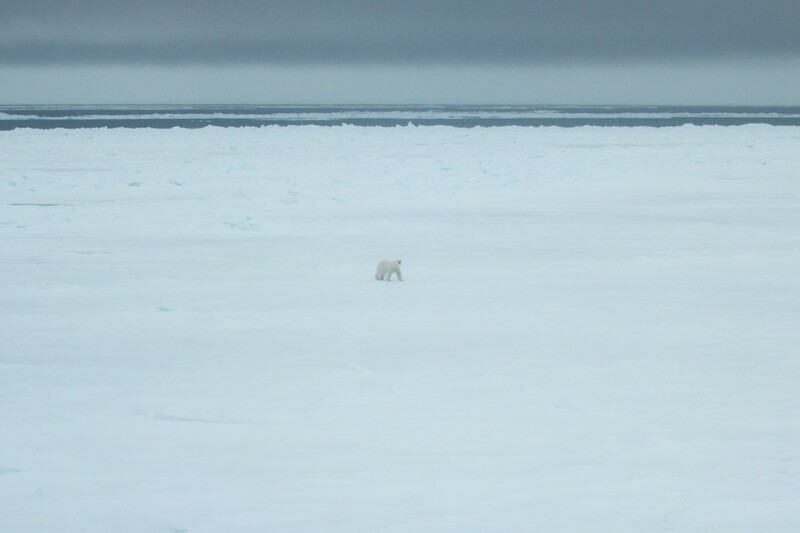 Eventually, the bear lumbered towards the ship, walking parallel to us, looking up at us, and then eventually to the water’s edge. By this time I believe it was eleven at night when we parted company. 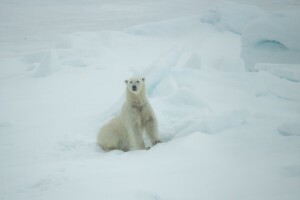 It was my first real polar bear encounter and I was glad to be on the ship rather than the ice. These animals are very powerful and most likely very hungry. It was an exciting night and I had to force myself to go to sleep. For those of you that know me well, you know this is WAY past my bedtime. 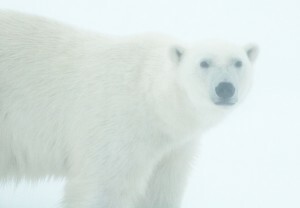 Little did I know, I would be up again just a few short hours later with one of the most memorable sightings of the expedition.